On March 31, 2012, the fourth ship in the Disney Cruise Line, the Disney Fantasy, took its maiden voyage from Port Canaveral, Florida, following an itinerary of the East and West Caribbean, and a stop at Disney’s Castaway Cay. The Disney Fantasy has 14 decks, and can hold up to 4,000 passengers, along with 1,450 crew members. In contrast to the Disney Dream, the Disney Fantasy features an art nouveau theme, with Dumbo as the ship’s mascot. 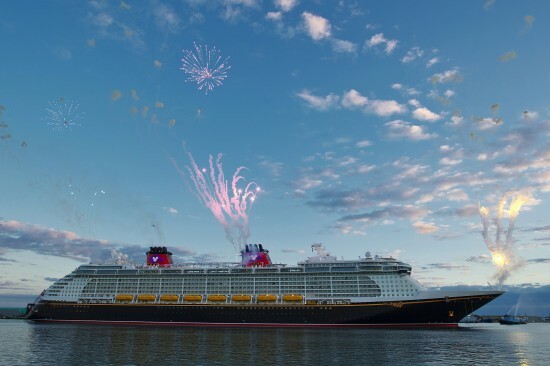 The celebration of the maiden voyage featured fireworks and appearances by Mickey Mouse, Minnie Mouse, Pluto, and Donald Duck. Posted in Uncategorized and tagged 2010s, Characters, Disney Cruise, Disney Event, Event. Bookmark the permalink. On December 23, 1998, La Théâtre, the custom-built theater for Cirque du Soleil opened in west side of Walt Disney World’s Downtown Disney area. This theater was built to showcase the La Nouba show, which is still being performed to this day. The outside of the theater was built to resemble a white circus tent; the inside of the theater has a mechanical stage with several movable parts, including platforms and movable glass cages. The show La Nouba (translated means “the party”) has more than 65 performers from 15 countries creating a dreamlike atmosphere for the audience. Posted in Uncategorized and tagged 1990s, Attraction, Disney Park, Event, Live Action. Bookmark the permalink.